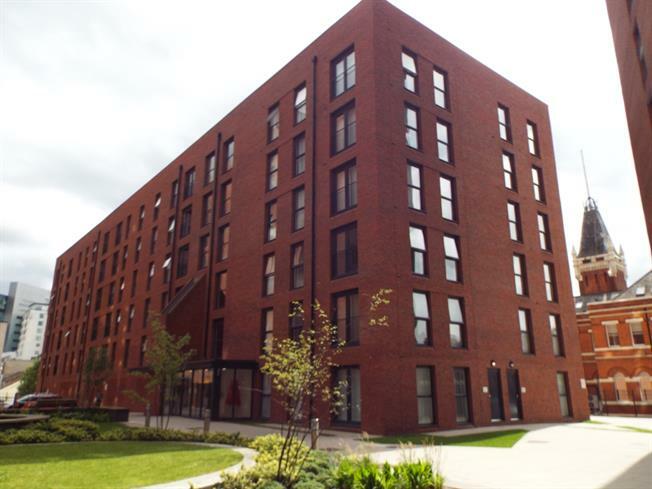 2 Bedroom Flat For Sale in Salford for Offers Over £170,000. A stunning purpose built luxury apartment within a stroll to the city centre. This first floor purpose built apartment is in block A. Suitable for investment only achieving 875 per colander month and rented until July 2018. Comprising of a hallway to an impressive living area incorporating a fitted kitchen. Two double size bedrooms with an en-suite shower room to the master bedroom plus a fitted bathroom. A great buy. UPVC double double glazed door, opening onto a balcony. Electric heater, laminate flooring, painted plaster ceiling, ceiling light. Roll edge work surface, fitted and wall and base units, stainless steel sink and with mixer tap, integrated, electric oven, integrated, electric hob, stainless steel extractor, integrated slimline dishwasher, integrated fridge/freezer. Double bedroom; double glazed uPVC window facing the rear overlooking the garden. Electric heater, laminate flooring, painted plaster ceiling, ceiling light. Heated towel rail, tiled flooring, tiled walls, painted plaster ceiling, ceiling light. Low level WC, single enclosure shower, wall-mounted sink. Heated towel rail, tiled flooring, tiled walls, painted plaster ceiling, ceiling light. Concealed cistern WC, roll top bath with mixer tap, thermostatic shower, wall-mounted sink with mixer tap, extractor fan. Laminate flooring, ceiling light. Space for washing machine.